For the tree species, see Manilkara chicle. Chicle (/ˈtʃɪkəl/) is a natural gum traditionally used in making chewing gum and other products. It is collected from several species of Mesoamerican trees in the genus Manilkara, including M. zapota, M. chicle, M. staminodella, and M. bidentata. 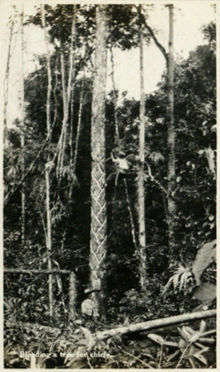 The tapping of the gum is similar to the tapping of latex from the rubber tree: zig-zag gashes are made in the tree trunk and the dripping gum is collected in small bags. It is then boiled until it reaches the correct thickness. Locals who collect chicle are called chicleros. The word chicle comes from the Nahuatl word for the gum, tziktli ([ˈt͡sikt͡ɬi]), which can be translated as "sticky stuff". Alternatively, "chichle" may have come from the Mayan word tsicte. Chicle was well known to the Aztecs and to the Maya, and early European settlers prized it for its subtle flavor and high sugar content. The word used in the Americas and Spain to refer to chewing gum, chicle being a common term for it in Spanish and chiclete being the Portuguese term (both in Brazil and in parts of Portugal, as most others parts also use the term chicla). The word has also been exported to other languages such as Greek, which refers to chewing gum as 'tsichla' (Τσίχλα). By the 1960s, most chewing gum companies had switched from using chicle to butadiene-based synthetic rubber which was cheaper to manufacture. Both the Aztecs and Maya traditionally chewed chicle. It was chewed as a way to stave off hunger, freshen breath, and keep teeth clean. Chicle was also used by the Maya as a filling for tooth cavities. Historically, the Adams Chewing Gum Company was a prominent user of this ingredient in the production of chewing gum. In response to a land reform law passed in Guatemala in 1952 which ended feudal work relations and expropriated unused lands and sold them to the indigenous and peasants, the William Wrigley Company discontinued buying Guatemalan chicle. Since it was the sole buyer of Guatemalan chicle, the government was forced to create a massive aid program for growers. By the 1960s, most chewing gum companies had switched from using chicle to butadiene-based synthetic rubber which was cheaper to manufacture. Only a handful of small gum companies still use chicle, including Glee Gum, Simply Gum, and Tree Hugger Gum. ^ Mathews, Jennifer P. (2009). Chicle: The Chewing Gum of the Americas, From the Ancient Maya to William Wrigley. Tucson: University of Arizona Press. pp. 19–21. ISBN 0-8165-2821-7. ^ Chicle, Merriam-Webster.com. Retrieved 17 March 2011. ^ Mathews, Jennifer P. (2009). Chicle: The Chewing Gum of the Americas, From the Ancient Maya to William Wrigley. Tucson: University of Arizona Press. pp. 1–11. ISBN 0-8165-2821-7. ^ Harris, Kate (2009). Trees of Belize. Belize: Bay Cedar Publishing. p. 94. ISBN 978-0-9927582-0-2. ^ LaFeber, Walter (1993). Inevitable revolutions: the United States in Central America. New York: W.W. Norton. p. 119. ISBN 0-393-30964-9. ^ Burks, Raychelle (6 August 2007). "Chewing Gum: Popular confection began as a not-so-sweet treat from trees". Chemical and Engineering News. 85 (32): 36. doi:10.1021/cen-v085n032.p036.